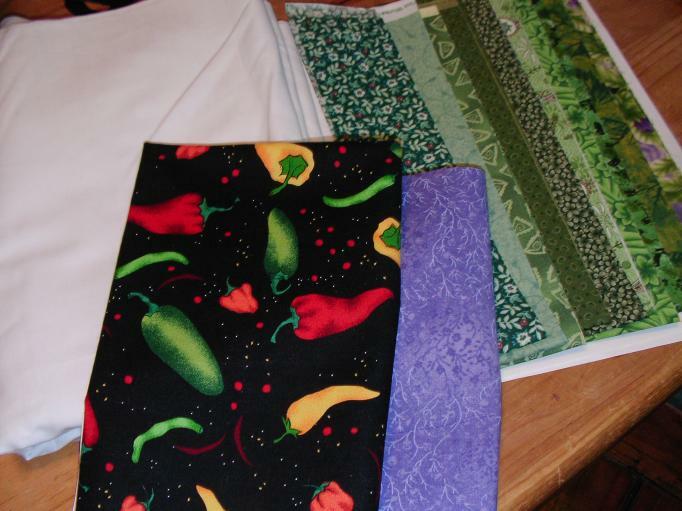 I bought 3 metres of snow white muslin for the turquoise quilt project, a half metre of chili peppers fabric for a quilt that is still in my head until I get enough fabric to start it, and a fat quarter of nice purple to top up my stash. I also got 3 FQs worth of jelly-roll type strips for the green UFO. I like these strip sets. It’s great to have such variety in small quantities. I only count fabric as used when the flimsy is done, and I haven’t finished anything this week, so I have nothing to report in the Used column. But I have done lots of cutting and sewing. I’m working on four projects at the same time and assigning them specific days. Then I spend my whole sewing day (about 2 hours total) on one project, and I’m making pretty good progress on each. It’s lots of fun, anyway! Please visit Judy’s blog to see how others are progressing with their stash reports this week. I do love your new purple fabric. Is it “Fusions” by Robert Kaufman? I almost weakened and added that same fabric to my shopping list this week (of course I already bought enough). Pretty fabric. I love the hot peppers! It sounds like you have gotten alot accomplished on your projects.